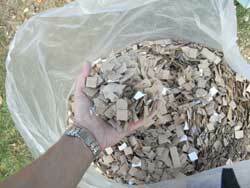 Ecobed from Earthly Enterprises is a new kind of poultry bedding that is made from chopped cardboard. What you get are clean squares of cardboard about 15mm square that are free of ink or print. 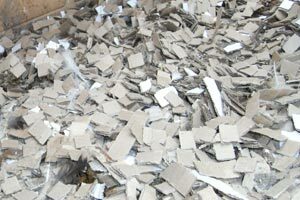 There are a number of factors to consider with poultry bedding, it must be absorbent, and non-toxic to the birds, but most importantly free of dust since chickens are prone to respiratory problems. 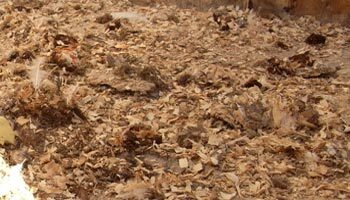 I have been using dust extracted wood shavings for a number of years with straw in my nest boxes but since I compost all of my poultry bedding, the one big disadvantage of using wood shavings is the time it takes for it to rot down. It currently takes around 18 months for me to get that rich crumbly mixture that works wonders in the garden and while it rots down, I have to store it and turn it once in a while. Cardboard on the other hand rots down much quicker on the compost heap. This provides a big saving not only in the time it takes to make the compost but also the number of compost bins I need to keep and turn. I decided to run a test, using Ecobed in one of my chicken houses. I would use my usual half a bucket of wood shavings for a week and then use the same quantity of chopped cardboard for the next week and compare the state of the coop at the end of each week. As you can see from the photos I took, the half a dozen chickens in the trial made a fair mess of both the bedding materials. Soiled Ecobed and wood shavings after one week of use. From inspecting the bedding at the end of the week, I would say that both were as absorbent as one another, however the sawdust and dried out muck was far dustier than the cardboard. The cardboard also didn’t compact as much so much of it was turned over in the house, moving the mess below the top surface. Scraping out the house was far more pleasant without as much dust and this can only be an advantage for my chickens to help prevent respiratory problems. Another big advantage I found with the Ecobed was it didn’t get trodden out of the house like the wood shavings normally do and the few that did were easier to pick up. I was impressed with this bedding although it took me a bit of getting used to seeing when looking inside the houses and I’m looking forward to adding this to my compost heap! I have added it to another two houses and will see how much my composting time can be reduced. After more than ten years supplying pet bedding, Earthly Enterprises has stopped supplying single bales of Ecopetbed. They continue to supply pallets of bedding throughout the country though. Omlet sell Ecobed in single bales if you would like to try it for yourself. There is also more information here about the different kinds of poultry bedding.